Clear Capital reported this afternoon that their home price index has fallen 6% over the past two months, which has wiped away any gains seen last spring during the artificial home buyer tax credit. One of the more popular bullish arguments for the future direction of the stock market is all the cash on the sidelines that companies are currently holding. The chart below shows the top 50 companies in the US by size. The green line shows their cash holdings, and the pink lines overlapping them show their debt. The total cash holdings currently stand at a record $3.71 trillion. This is the number you hear on the news and from mutual fund sales people. 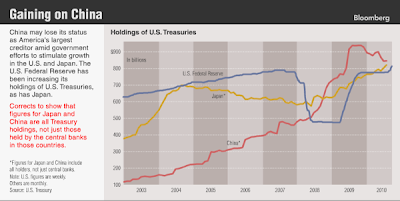 The total debt holdings currently stand at a record $4.45 trillion. This is the number you do not hear about. This is the other side of the ledger. 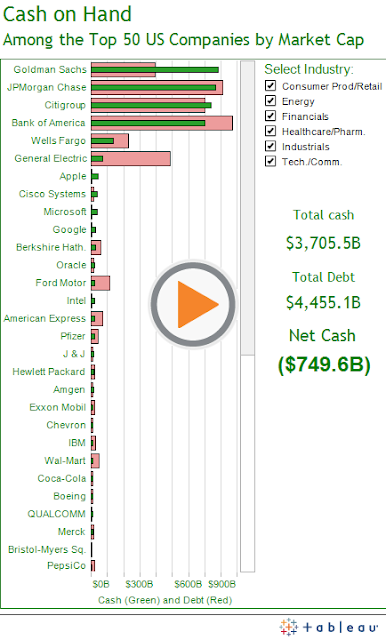 The total cash holdings are at negative $749.6 billion. The 5 banks at the top are even more interesting in that they are hoarding cash for future write downs on their balance sheets. They have hidden losses that are currently rotting in a dark location. Two of the companies, Apple and Google, have a tremdendous amount of cash and essentially no debt. They have the ability to be large players in the acquisition department over the next few years. 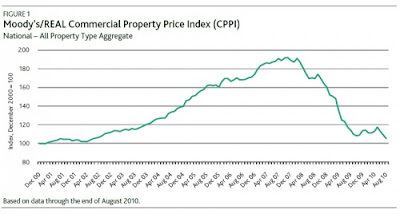 The much acclaimed "bottom" for commercial property appears to be rolling over once again as can be seen by the chart below. The bright spot for commercial properties this year have been the A+ properties which have been selling at high premiums as investors have piled into the artificial market recovery. We have seen weakness beginning in the A+ market over the past few months and soon all three (A, B, C) property sectors will begin their next leg downward together. 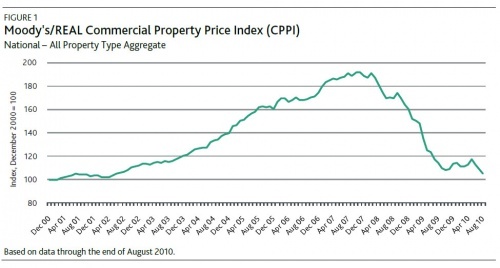 Banks still continue to hold assets at full value (2007 prices on the chart below) as they extend and pretend that prices will soon recover. They will not, and the next leg down will be a blood bath. This weekend Eric King of King World News posted a tremendous interview with Jim Rickards who is one of the greatest financial minds in the world today. Click here for the most recent interview and for access to his recent discussions which are all worth listening to. In the interview Jim discusses the fact that the United States government currently owns more gold than any other country by far. China, Japan, the UK, and Russia all have an extremely low supply of gold in relation to their total currency supply. It is fairly obvious to market participants that the end of this global fiat (paper) money system, which began in August 1971, is in its final chapter. It has been a 40 year experiment that will end with the collapse of the paper money system. What is important to understand is that while the United States currency will fall the furthest compared to other paper currencies, and perhaps even go to zero in value, our country owns the most "real" money in gold. This coupled with our military power will make our country a powerhouse during the coming change in the global currency system. Before 1971, when countries ran a deficit they had to send a foreign country gold in return for the additional goods. This provided a balance of payments because when the country ran out of gold they could no longer borrow and spend. They had to become producers of goods to earn the gold back. This began to happen in the late 1960's as gold was pouring out of the United States vaults. President Nixon, understanding what was taking place, took us off the gold standard and declared that currencies would be valued only against each other. For the first time in history all currencies around the world were backed by nothing except the promise of government to repay in the future. This proved to be an enormous benefit to the United States. Over the last 40 years, instead of having to rebuild our manufacturing base, save, and work hard, we have just sent the rest of the world paper dollars, I.O.U. 's, in exchange for their hard work and goods. This would obviously have to come to an end at some point and we have reached that point. Our largest creditors are no longer purchasing our debt, it is now being purchased by the Federal Reserve with a printing press. Bernanke is conducting an experiment that has only ended in disaster in the past. What is important to understand is that the United States as a country will survive the coming re-set due to the government's gold holdings. However, most of our citizens will be wiped out during the process. The process will provide the greatest wealth transfer in history from those holding paper assets to those holding tangible assets. Where we go from there is unknown. We are in uncharted territory. The following comes from a member of the financial industry who has been working in the mortgage business on the front lines. It is the most clear and concise explanation of the current foreclosure situation. 2. The large banks may be taking massive losses. The banks may have to re-purchase the mortgage securities that they sold out to investors. When these securities hit their books they will ultimately have to recognize losses when the foreclosed homes re-enter their balance sheet. These new losses will be added on to the current shadow losses that sit on their balance sheet due to the accounting changes back in March of 2009. This is why the banks are sitting on over $1 trillion in cash, waiting for judgement day. “Before mortgage-backed securities, most mortgage loans were issued by the local savings & loan. So the note usually didn’t go anywhere: it stayed in the offices of the S&L down the street. “But once mortgage loan securitization happened, things got sloppy…they got sloppy by the very nature of mortgage-backed securities. “The whole purpose of MBSs was for different investors to have their different risk appetites satiated with different bonds. Some bond customers wanted super-safe bonds with low returns, some others wanted riskier bonds with correspondingly higher rates of return. “Therefore, as everyone knows, the loans were ‘bundled’ into REMICs (Real-Estate Mortgage Investment Conduits, a special vehicle designed to hold the loans for tax purposes), and then “sliced & diced”…split up and put into tranches, according to their likelihood of default, their interest rates, and other characteristics. “These various tranches were sold to different investors, according to their risk appetite. That’s why some of the MBS bonds were rated as safe as Treasury bonds, and others were rated by the ratings agencies as risky as junk bonds. “But here’s the key issue: When an MBS was first created, all the mortgages were pristine…none had defaulted yet, because they were all brand-new loans. Statistically, some would default and some others would be paid back in full…but which ones specifically would default? No one knew, of course. If I toss a coin 1,000 times, statistically, 500 tosses the coin will land heads…but what will the result be of, say, the 723rd toss? No one knows. “So in fact, it wasn’t that the riskier loans were in junior tranches and the safer ones were in senior tranches: rather, all the loans were in the REMIC, and if and when a mortgage in a given bundle of mortgages defaulted, the junior tranche holders would take the losses first, and the senior tranche holder last. “But who were the owners of the junior-tranche bond and the senior-tranche bonds? Two different people. Therefore, the mortgage note was not actually signed over to the bond holder. In fact, it couldn’t be signed over. Because, again, since no one knew which mortgage would default first, it was impossible to assign a specific mortgage to a specific bond. “Therefore, how to make sure the safe mortgage loan stayed with the safe MBS tranche, and the risky and/or defaulting mortgage went to the riskier tranche? “Enter stage right the famed MERS…the Mortgage Electronic Registration System. “MERS was the repository of these digitized mortgage notes that the banks originated from the actual mortgage loans signed by homebuyers. MERS was jointly owned by Fannie Mae and Freddie Mac (yes, those two again …I know, I know: like the chlamydia and the gonorrhea of the financial world…you cure ‘em, but they just keep coming back). “The purpose of MERS was to help in the securitization process. Basically, MERS directed defaulting mortgages to the appropriate tranches of mortgage bonds. MERS was essentially where the digitized mortgage notes were sliced and diced and rearranged so as to create the mortgage-backed securities. Think of MERS as Dr. Frankenstein’s operating table, where the beast got put together. “However, legally…and this is the important part…MERS didn’t hold any mortgage notes: the true owner of the mortgage notes should have been the REMICs. “But the REMICs didn’t own the notes either, because of a fluke of the ratings agencies: the REMICs had to be “bankruptcy remote,” in order to get the precious ratings needed to peddle mortgage-backed Securities to institutional investors. “So somewhere between the REMICs and MERS, the chain of title was broken. “You can endorse the note as many times as you please…but you have to have a clear chain of title right on the actual note: I sold the note to Moe, who sold it to Larry, who sold it to Curly, and all our notarized signatures are actually, physically, on the note, one after the other. “To repeat: if the chain of title of the note is broken, then the borrower no longer owes any money on the loan. “Read that last sentence again, please. Don’t worry, I’ll wait. “You read it again? Good: Now you see the can of worms that’s opening up. “The broken chain of title might not have been an issue if there hadn’t been an unusual number of foreclosures. Before the housing bubble collapse, the people who defaulted on their mortgages wouldn’t have bothered to check to see that the paperwork was in order. “But as everyone knows, following the housing collapse of 2007-’10-and-counting, there has been a boatload of foreclosures…and foreclosures on a lot of people who weren’t sloppy bums who skipped out on their mortgage payments, but smart and cautious people who got squeezed by circumstances. “These people started contesting their foreclosures and evictions, and so started looking into the chain-of-title issue, and that’s when the paperwork became important. So the chain of title became crucial and the botched paperwork became a nontrivial issue. “Now, the banks had hired ‘foreclosure mills’…law firms that specialized in foreclosures…in order to handle the massive volume of foreclosures and evictions that occurred because of the housing crisis. The foreclosure mills, as one would expect, were the first to spot the broken chain of titles. “Wait, why am I hedging? The foreclosure mills did actually, deliberately, and categorically fake and falsify documents, in order to expedite these foreclosures and evictions. Yves Smith at Naked Capitalism, who has been all over this story, put up a price list for this ‘service’ from a company called DocX…yes, a price list for forged documents. Talk about your one-stop shopping! “So in other words, a massive fraud was carried out, with the inevitable innocent bystanders getting caught up in the fraud: the guy who got foreclosed and evicted from his home in Florida, even though he didn’t actually have a mortgage, and in fact owned his house free – and clear. The family that was foreclosed and evicted, even though they had a perfect mortgage payment record. Et cetera, depressing et cetera. “Now, the reason this all came to light is not because too many people were getting screwed by the banks or the government or someone with some power saw what was going on and decided to put a stop to it…that would have been nice, to see a shining knight in armor, riding on a white horse. “But that’s not how America works nowadays. “No, alarm bells started going off when the title insurance companies started to refuse to insure the titles. “In every sale, a title insurance company insures that the title is free -and clear …that the prospective buyer is in fact buying a properly vetted house, with its title issues all in order. Title insurance companies stopped providing their service because…of course…they didn’t want to expose themselves to the risk that the chain of title had been broken, and that the bank had illegally foreclosed on the previous owner. “That’s when things started getting interesting: that’s when the attorneys general of various states started snooping around and making noises (elections are coming up, after all). “The fact that Ally Financial (formerly GMAC), JP Morgan Chase, and now Bank of America have suspended foreclosures signals that this is a serious problem…obviously. Banks that size, with that much exposure to foreclosed properties, don’t suspend foreclosures just because they’re good corporate citizens who want to do the right thing, and who have all their paperwork in strict order…they’re halting their foreclosures for a reason. “As soon as the White House announced the pocket veto…the very next day!…Bank of America halted all foreclosures, nationwide. “Why do you think that happened? Because the banks are in trouble…again. Over the same thing as last time…the damned mortgage-backed securities! “The reason the banks are in the tank again is, if they’ve been foreclosing on people they didn’t have the legal right to foreclose on, then those people have the right to get their houses back. And the people who bought those foreclosed houses from the bank might not actually own the houses they paid for. “And it won’t matter if a particular case…or even most cases…were on the up -and up: It won’t matter if most of the foreclosures and evictions were truly due to the homeowner failing to pay his mortgage. The fraud committed by the foreclosure mills casts enough doubt that, now, all foreclosures come into question. Not only that, all mortgages come into question. “People still haven’t figured out what all this means. But I’ll tell you: if enough mortgage-paying homeowners realize that they may be able to get out of their mortgage loans and keep their houses, scott-free? That’s basically a license to halt payments right now, thank you. That’s basically a license to tell the banks to take a hike. “What are the banks going to do…try to foreclose and then evict you? Show me the paper, Mr. Banker, will be all you need to say.